Last weekend proved to be a disappointing one for Walsden who suffered both league and cup losses to Heywood. 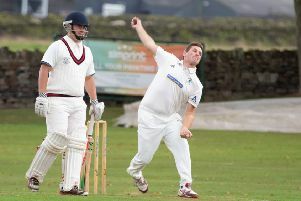 Walsden’s title ambitions in the Central Lancashire League Premier Division took a blow on Saturday with a four-wicket defeat to their rivals. Walsden won the toss and elected to bat, a decision that played out with good work in the top order from opener Jake Hoosen (29) and no2 Shubham Harkel (39) in a solid 63-run first-wicket stand. That was followed-up by Matthew Dawson (59) and Umesh Karunaratne (82 not out) as the visitors set 237-6. However, Walsden were undone by opener Bobby Cross (92) and Robert Nicol (111) as Heywood marched to 237-6 in reply. Joe Gale (2-15) and Karunaratne (2-73) led the Walsden attack. Walsden are now second in the table and two points behind title rivals Norden, who won by 68 runs at Littleborough. Daniel Salpietro (130 not out) and Simon Harman (90) gave Norden a scintillating start before Rehan Udwadia weighed-in with 44 to guide the visitors to 279-1. Littleborough put in a solid effort in reply but they ran out of overs on 211-7. The news wasn’t any better on Sunday when Heywood inflicted a three-wicket defeat on Walsden in the semi-finals of the Twenty20 Knock-Out Cup. Walsden put 140-8 on to the scoreboard but Heywood booked their place in the final with a reply of 141-7, despite the efforts of Joe Gale (3-16) and Jamie Shackleton (2-26). Heywood win by 5 wickets. Heywood 4 pts, Walsden 0 pts. Bowling: C Humphreys 11 0 49 0, J Keyworth 7 0 29 0, D Pawson 10 0 52 2, J Morley 12 2 49 0, J Lovell 6 3 23 1, R Nicol 4 0 29 2. Bowling: J Shackleton 5 0 19 0, S Barker 6 0 39 1, U Karunaratne 20 1 73 2, J Hooson 11 2 50 0, J Gale 3 0 16 0, N Barker 2 0 18 0, Joe Gale 3 0 15 2.